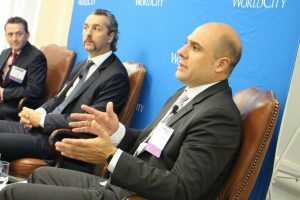 The Pulse of Healthcare in Latin America - WorldCity, Inc.
Click here for our Facebook photo album from the event. 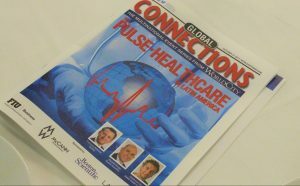 What is the future of healthcare of Latin America, and is that future promising in the markets that make up the region? WorldCity’s latest Global Connections event centered on that, led by a panel of experts with a finger on the pulse of what is working well in this industry in that area of the world. A quick poll of those in attendance, many of which work in the healthcare sector, showed most believe the industry in Latin America will grow in 2018. The panel agreed, citing an aging population, changes in regulations and growth in Brazil as reasons for optimism. The trade data indicates upwards of 15 percent growth for the first half of 2017, which is massive, said Corpart. Many developments are contributing to that potential growth in the Latin American healthcare sector. Eduardo Verges, right, Country Manager for Mexico and Central America at Boston Scientific. Getting more Latin Americans into the healthcare system will increase revenues for the region, as many in the developing countries or rural areas do not currently have access. 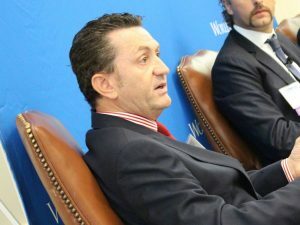 In fact, access is Boston Scientific’s top priority in the region, said panelist Eduardo Verges, the country manager for Mexico and Central America for that company. Verges added medical devices can be obtained via payment plans but more importantly, with warranties. “How do you see that in Latin America?” asked Mauricio Ortiz from the audience, president for Latin America at Boston Scientific. “There’s definitely a space for the virtual doctor,” Corpart responded, noting an app by a Colombian company that allowed anybody with a smartphone to see a doctor and get a diagnosis, especially helping those living in rural areas. 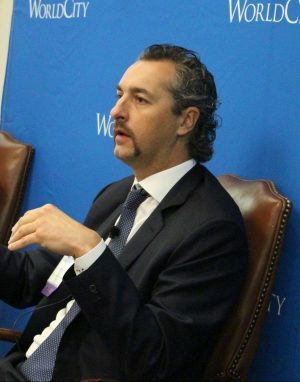 The app has gone as far in its development as implementing IBM Watson artificial intelligence and has grown outside the borders of Colombia, with one-third of its user base now in Mexico, said Corpart. This echoes the previous emphasis on access to healthcare, utilizing technology as another means to deliver products and services to patients. Francisco Ballester, President for Latin America at Sandoz. On the topic of low cost medication, Edvard Philipson, vice president for Latin America at Ferring Pharmaceuticals, asked about how much online distribution will soon substitute for pharmacies, with direct marketing to consumers. Only 23 percent of private hospital beds are used in Mexico, said Verges, mentioning new goals there for public and private partnerships, as Mexico’s public hospitals are stressed. “Basically, taking advantage of what we already have and trying to come up with a solution,” said Verges. “How are you planning for the future to get information from the patient so that you can do a better job in your company?” asked one audience member, suggesting the possibility of analytics or big data, in order to reach the patient better. The challenge here, the panel noted, is 18,000 hospitals in Latin America, about three times more than the United States. Those hospitals have fewer beds than in the U.S., but because there are so many, it becomes a challenge logistically to collect that patient data. Therefore, we are likely a few years out from developing systems and gathering enough data to form actionable decisions, said Corpart. Verges also noted “emerging markets within emerging markets”, targeting areas that live hundreds of miles from formal healthcare facilities.